Oh yeah, deja vu all over again! 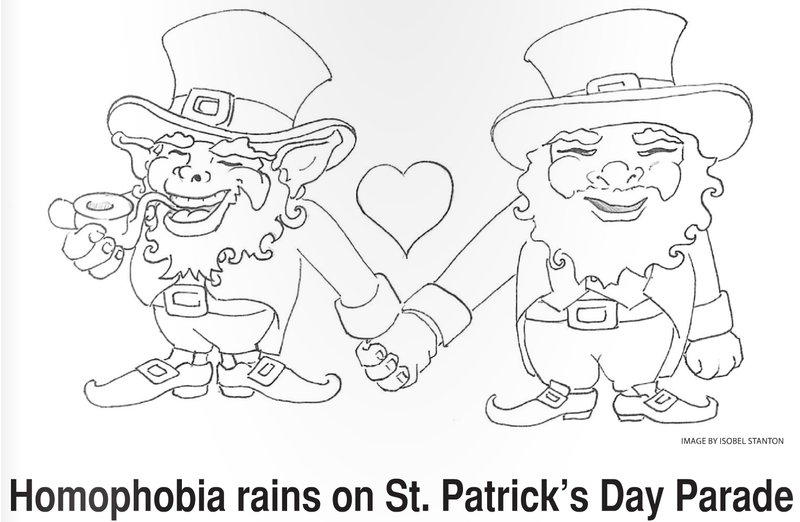 Last year, I found out about a group of LGBT Irish who sought to march in the NYC parade and were turned down. I was upset, thinking that those people wanted to celebrate the fact they were Irish and were refused because they also happened to be gay. They would have to choose whether to celebrate a part of their heritage that basically rejected them simply because of who they were. So I wrote a column for the Chronicle and cited a similar case in Boston that actually was the precedent that the NYC parade organizers used to exclude the group of LGBT Irish. In the column I mentioned how hard it was to find the policy online. Turns out I didn’t know where to look. Perhaps the rule cited by the parade council is unwritten and barely spoken about, but the court case ruling that favored the parade council in Boston over 15 years ago was easily found once I got the case name, thanks to the Boston.com article. Justice Souter delivered the unanimous opinion of the court on June 19, 1995. The Court reasoned that, even though the Council did not have a narrow, set message that it was intending to convey, the parade nevertheless constituted a message that the Council had a right to protect. Noting that, while the Council had been fairly lenient in its guidelines for who they chose to allow in their parade, the Court said this did not necessarily mean that the Council waived its right to present its message in a way it saw fit. The right to speak, the Court reasoned, includes the right to determine “what not to say.” Of primary concern to the Court was the fact that anyone observing the parade (which regularly gained a large number of spectators) could rationally believe that those involved in the parade were all part of an overriding message the Council was seeking to provide. In this vein, the unanimous Court said that the Council could not statutorily be prohibited from excluding the messages of groups it did not agree with. Effectively, the Council could not be forced to endorse a message against its will. Like with most supreme court rulings, it takes a couple read-throughs to comprehend it. But at least it does have a sense of logic, even if that logic was used to come to a decision that I disagree with. I just hate the idea of this accepted practice of exclusion. It won’t change anytime soon, as the court ruling basically said it was up to the parade councils to determine what kind of “message” they wanted to say with the units in their parades. Have the parade organizers not heard of the axiom that actions speak louder than words? By not including Gay and Irish groups for many years in a row, they are telling the public that they are old fashioned and narrow-minded, maybe even bigoted. They are also sending a message to gays: that are gay first and foremost and that makes them less Irish than their straight counterparts. The only solution I can see is a game of patience. The Gay Irish groups must sadly wait for the last of the old guard who wish to exclude them to die off. Then they can approach the parade’s councils again and hopefully march openly. Somehow the bill passed the state’s judiciary committee last week. Its shaky rhetoric establishes justifiable homicide of an abortion worker as the lawful defense of one’s self, spouse, parent, child, master, mistress, servant, or an unborn child that belongs to that person. By the time the rest of the nation heard about this bill, it was branded as the bill that would allow the murder of abortion workers. However, there are deeper consequences to such a bill being passed. The bill would not only affect abortion workers, but also the outcome of every murder trial in the state as well. Trials would become ten times more complicated as the defense would scramble to use the bill’s muddled diction and vague definitions as defense. Prosecutors would have to wade through every last detail of the case in order to prove not only that the defendant did commit homicide, but that it wasn’t justified in any sense of the bill. The burden of proof for the prosecution would become even heavier. Time is hurtling by faster than ever. Already I have to start thinking about Christmas. Last year I wrote how I was conflicted over the holiday. And this year I think I still am, but not nearly to the extent I was last year. I’m more at peace celebrating the many different Christmases all on the same day than I was last year. But I still wrote about the holiday in my last column for the Chronicle. For one holiday it can be too materialistic (why else do we have Black Friday), too religious (How can Jesus be the reason for the season, he wasn’t born on 12/25) and yet too secular all at the same time (“okay if you’re putting up a nativity scene we want to see a Menorah and Santa and some Kwanzaa candles while you’re at it”, and saying Happy Holidays) . The holiday has been claimed by the Christians as theirs to own, yet many of the traditions, like the Christmas Tree, Yule log, and gift giving, come from Pre-Christian times or pagan societies. Even the idea of the birth of the savior was co-opted from many pagan’s worship of the rebirth of their sun god.